Add an unforgettable charm to your Raksha Bandhan celebration with the aid of these Appealing Rakhi Delicacies in a Basket decked beautifully in the auspicious presence of a free Rakhi, Roli Tilak and Chawal. 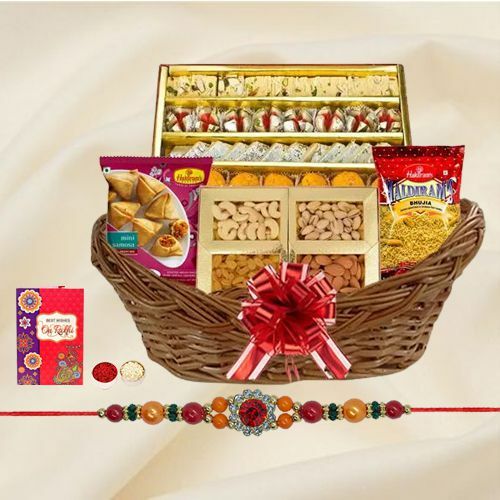 The Basket is loaded with Assorted Dry Fruits (200 gms), Haldiram Assorted Sweets (200 gms), Haldiram Bhujia (150 gms) and Haldiram Mini Samosa (200 gms). There might be a slight change in the displayed design of Basket.